Cow Meat Hung For Display, Sudden Presence of Hindu Groups: Bulandshahr Violence a Conspiracy? Cow Meat Hung For Display, Sudden Presence of Hindu Groups: Was Bulandshahr Violence a Conspiracy? The location and timing further fuels the suspicion that it was a planned attempt to stoke tension as nearly 10 lakh Muslim devotees had gathered in Bulandshahr to pray on Monday. Bulandshahr: Preliminary investigation by police officials and first-hand accounts of eyewitnesses of the Bulandshahr tragedy point towards a pre-planned attempt at spreading communal tension. 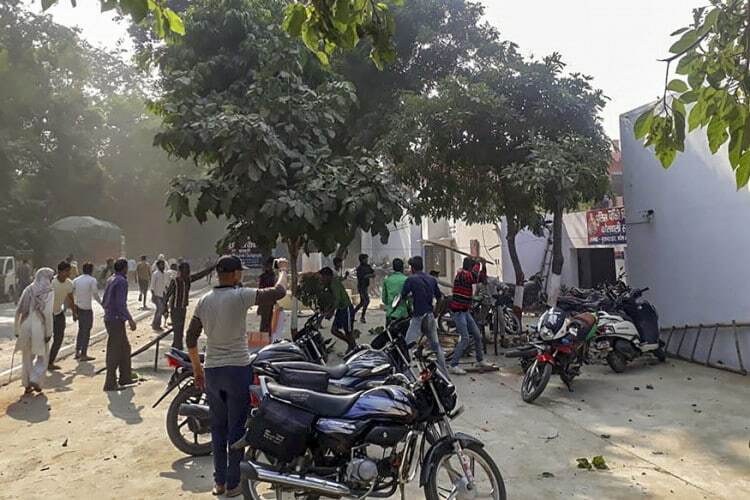 A violent clash between the police and villagers of Mahaw on Monday after a mob turned violent in an alleged case of illegal slaughtering of cattle, resulted in the death of station house officer (SHO) Subodh Kumar Singh, 47, and a youngster. The autopsy report of the SHO revealed that he was shot in the head. He was hit with a .32 bore bullet near his left eyebrow. Sumit, 20, breathed his last after coming in the way of police's retaliatory firing. The sequence of events that led to the clash, however, are too interconnected to be all but a coincidence. Among the first administrative officers to reach the spot in Mahaw village was Tehsildar Rajkumar Bhaskar. Talking to News18, he said, "Dead cow meat was hanging in a sugarcane field. Head and skin of a cow hung as if they clothes on a hanger. It is strange because anybody who would indulge in cow slaughter would not put it out for display knowing the situation in the state. It was visible from far away." The Tehsildar said that as soon as the news of dead meat spread, members of Hindu Yuva Vahini, Shiv Sena and Bajrang Dal appeared on the spot and started agitating. The crowd then loaded the carcass on a tractor and tried to take it towards Bulandshahr-Garhmukteshwar State Highway to protest. The location and timing further fuels the suspicion that it was a planned attempt to stoke tension as nearly 10 lakh Muslim devotees had gathered in Bulandshahr to pray on Monday as it was the last day of Ijtema, an essential part of the Tablighi Jamaat. The devotees were also supposed to take the Bulandshahr-Garhmukteshwar State Highway to return the very day. Back in Mahaw, the state-officers and local police stood in front of the tractor and requested the mob to calm down. "We wanted the matter to end in the village itself," added the Tehsildar. However, the crowd did not budge. Almost a hundred men in tractors reached Chingravati police post on the highway. The crowd soon multiplied in size. The police tried to reason with them and questioned them to register an FIR, but the mob turned violent. Bulandshahr District Magistrate (DM) Anuj Jha said he had received information around 11 am that 15-20 cow carcasses were recovered by residents of Chingravati in Syana. “People carried these carcasses in tractors and other vehicles to state roads, and in front of the Chingravati police chowki. Police officers from Syana station began questioning these people to file an FIR. During that process, certain anti-social elements created a ruckus and light force had to be used to contain them. Matters escalated and people began pelting stones,” he said. It was during this clash that Siyana SHO Subodh Kumar Singh was shot dead while his gunner sustained a critical injury. "I would say that the police officer was brave that he ventured into the crowd alone to pacify them. He was just doing his job. He was known to be a person who never backed down from any tough situation. We have lost an asset,” DM Jha added. Several police officers present at the spot later informed that the cop could have been saved, but the mob did not let him be taken to the hospital. Ram Ashray, who was driving the SHO’s vehicle, was among the first ones who spotted the injured officer. He rushed to him in his car in order to get him first aid. “He was lying on the ground. I drove the car to a field and put him in it. As soon as we began moving, a mob landed and started shouting, ‘maaro, maaro’. They were throwing stones from behind trees. Everyone started running away. I ran as well. The SHO was already injured and we were trying to take him to the hospital. We could hear gunshots from the sugarcane fields,” he said. According to police, the SHO and the policemen with him were cornered by the mob. An initial round of firing in the air to disperse them angered the crowd further. Later on Monday night, News18 spoke to several police officials who identified most of the stone-pelters as members of Bajrang Dal, Hindu Yuva Vahini and Shiv Sena. 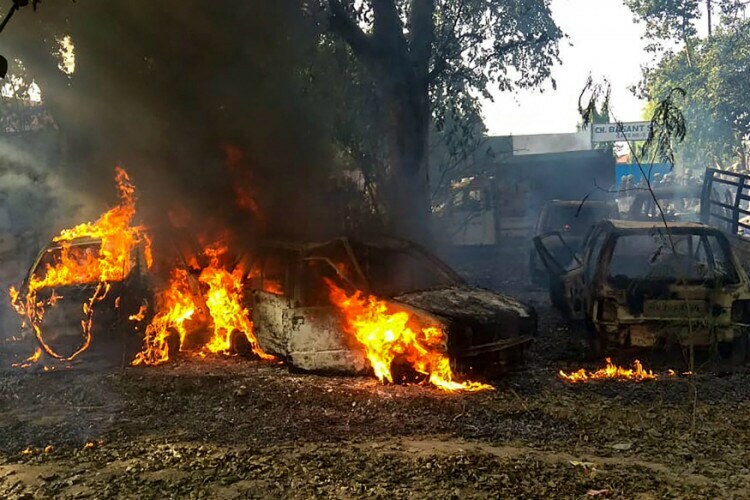 In the video footages that surfaced after the incident, villagers can be seen hurling stones, putting police vehicles to fire and vandalising public property. "Several of these people are members of Bajrang Dal, Hindu Yuva Vahini and Shiva Sena," said an officer who was on duty when the incident occurred. He refused to divulge his identity. The development was confirmed by several other officers. However, district head of Bajrang Dal in Bulandshahr, Yogesh Raj, denied all such allegations. "We were there at the spot because we were the ones who informed police about the incident. Our motive was not to stoke any violence." Representatives of Hindu Yuva Vahini and Shiv Sena remained unavailable for comment. Meanwhile, one of the villagers residing very close to the field where the carcass was found said he did not see any cow meat on the preceding day. "I live right opposite the field. There was no dead meat during the previous day. It was only on Monday did we see these things. Also, I didn't see anybody cutting the meat," he said. Uttar Pradesh police denied that any communal angle was involved in the case and said the incident was not linked to the conclusion of the Ijtema, a three-day religious congregation. “Please don’t spread misinformation. This incident is not linked to the Ijtema procession in any way. The Ijtema concluded peacefully. The current incident happened 45-50 kilometres away from where the Ijtema was held. Some rowdy elements are the perpetrators of this incident. Statutory action is being taken in the case,” Bulandshahr Police tweeted from its official handle. Late Monday night, chief minister Yogi Adityanath announced Rs 50 lakh assistance to the family members of Subodh Kumar Singh. The government also promised a job to a family member as well as “extraordinary” pension for the dependent family members. "Let me touch my husband once. He will be fine," said the wife of the dead SHO, crying, outside post-mortem wing in Bulandshahr's hospital. Singh is survived by two sons. He had been posted as a sub inspector in Meerut and had also served in Muzaffarnagar and Saharanpur. He was originally from Turgna village in in Etah district. Surendra Singh, a close friend of the SHO said that he was in the police, but his behavior was very polite. He was always ready to help people. He used to discuss current changes and job challenges in the police department. Sumit, who was shot in police firing, was taken to a private hospital in Meerut, where doctors declared him dead. His sister Babli, who was present in the town during the incident informed News18 that Sumit was a second-year student of Bachelor of Arts. He was the youngest in the family. Babli said Sumit was on his bike to drop a friend and got shot in his chest while passing through. Babli said that Sumit's friend later told that the police had shot him.